Honokanai'a, Kaho'olawe — Shortly before 1 p.m., the bow of the Makali'i rounded the tip of the bay, the first of three voyaging canoes to arrive at Kaho'olawe. Dozens stood on the shore, chanting, waving and clapping. Andre Perez greets the voyaging canoes Makali'i, Hokule'a and Ho-kualaka'i with a call from a pu. Hours later, once the Makali'i, Hokule'a and Hokualaka'i were finally moored in place and the sun was dipping lower in the sky, the greeting sound of the pu, or conch shell, sounded from someplace on board. "That's Uncle Maka!" shouted several people on shore, somehow recognizing the particular sound produced by crew member Makanani Atwood. A pu chorus from the sandy beach hooted in reply. 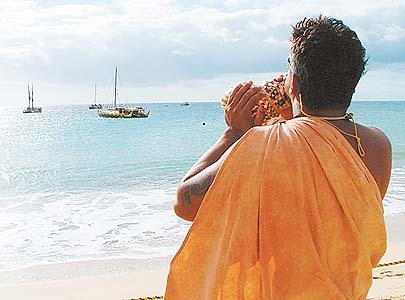 On the beach, Mau Piailug, the Micronesian master navigator whose sharing of traditional knowledge gave birth to Hawai'i's voyaging academy, said Kaho'olawe long has been known in his culture as a guidepost for Pacific travelers. "They would come here first, and they talk to the spirit of this place," he said. 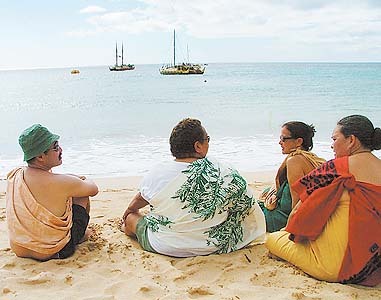 Members of the Protect Kaho'olawe 'Ohana — Burt Sakata, Colette Machado, Davianna McGregor and Kalei Tsuha — await the arrival of crew members aboard three voyaging canoes that came for the dedication of a navigational training center on the island. This weekend, that spirit seemed to inhabit twin celebrations, sponsored by the state's Kaho'olawe Island Reserve Commission and the Protect Kaho'olawe 'Ohana. It was the first access to the island since the Navy withdrew completely in April. On Thursday, the 'Ohana's "early warriors" — veterans from the movement to reclaim the island from the Navy — set up camp by the bay for a reunion. And yesterday, the canoes arrived to mark the launching of a new generation of voyagers. An outcropping known in ancient times as Kealaikahiki — a place where a panoramic vista of the star-studded night skies made it a natural classroom for the art of wayfaring — was rededicated to that purpose and will become a place where the Polynesian Voyaging Society will train its new navigators. The gathering of some 200 people on that sandy beach merged two of the proudest achievements in three decades of the Hawaiian cultural renaissance: the revitalizing of the Polynesian seafaring tradition and the salvaging of an island once used as a military training target. One of the earliest of the early warriors, Charlie Maxwell, sat in a folding chair under the kiawe tree, remembering the first time he ventured onto the island to hunt. From his home in Kula he could hear the Navy bombs dropping, so he knew all about the decades of military training. He didn't realize, he said, how much beauty was being laid waste. "I thought it was just a little island, all desolate," he said. "I was shocked to find all these beautiful sandy beaches." When the 'ohana began its occupations in January 1976, the first man off the first boat was Kimo Aluli, then 20. When the Navy sent a threatening letter, Aluli backed off, never returning until this weekend. "I thought there wasn't a possibility that this would become a reality," he said. That reality - children playing in the sand, grandparents relaxing beneath the campsite tarp — contrasts starkly with some harsh memories held by Maxwell and many others. Maxwell recalled when he was angry enough at a Navy officer to present him with a lei strung with goat droppings. Kaho'olawe was a war zone. Earl and John DeLeon, brothers from Kona, recall the sound of bombs dropping during their illicit visits, in 1977 and 1978. Earl DeLeon looked about him at the peaceful scene. "Finally!" he sighed, and tears streaked his face. John DeLeon is a Vietnam vet, now retired, but at the time was still on active duty in the Army. He said he gleefully applied his military training toward hiding from the Navy search teams. "I just loved the game!" he said with a laugh. The occupation of Kaho'olawe, in the days before the bombing stopped in 1990, was women's work as well. In February 1978, Joyce Kainoa was one who scaled a cliff considered insurmountable. "We made it to the top of the mountain, and then we had to laugh, because we were in the middle of the target zone," she said. "We didn't carry any arms with us. Women were not supposed to be on the island, I guess, because we're all supposed to be helpless." In the midst of all the reminiscing, some of the "warriors" chatted about plans for the new era of peace. Noa Emmett Aluli, chairman of the Kaho'olawe Island Reserve Commission, and Stanton Enomoto, a former commission chief of staff, reflected on plans for restoring some of the 2,500 archaeological features and ongoing work of reforestation. The island will become a place to relearn old traditions, Aluli said, and will become the "piko" (center) of Hawaiian sovereignty. "This will be a place where the culture will continue to be seeded and grow," he said.